White Vein Kratom, for many, is a coffee substitute. It’s popular among people who need to stay energized (especially in the morning), though it also helps in achieving a peaceful state of mind. It’s safe to take white vein in doses of up to 10 grams (for expert users), though first-timers should start with just a gram. If you’re looking for a pick-me-up without the sugars and additives, this might be a worth a try. Which Alkaloids Are Present in White Vein Kratom? Coffee is good but when caffeine sets in, it can make us feel nervous. White vein kratom gives a similar effect without the jitters, making it a better choice for those in need of a pick-me-up. This strain improves both concentration and memory, meaning it could be good for people who want to do better at work. It even helps in the fight against stress. Our mood affects how well we do our daily tasks—and it also has an impact on our health. White vein kratom can serve as an anti-depressant, which is actually one of its more popular uses. This variety of kratom is known to soothe pain. Although there are more potent options, it’s still suited for those looking to fight off minor aches from common activities. Mitragynine is the main alkaloid present in this strain, at a ratio higher than that of red vein kratom and most other kratom strains. This compound is generally associated with the herb’s energy-boosting effect. White vein doesn’t have much 7-hydroxymitragynine, which partly explains its limited analgesic potential. Its relatively low amounts of ajmalicine and speciogynine further reduces is effectiveness as a pain killer. A dosage of around 1 to 5 grams should be enough to enjoy the herb’s stimulant effect. Excessively high doses may lead to vomiting, constipation, and sweating. We recommend starting with a low dose and gradually increasing your intake depending on your needs. The effects of white vein kratom can last from 60 to 90 minutes. Most importantly, keep in mind that white vein is rather odd when it comes to delivering its effects. Some people get a noticeable change in their energy and alertness, while others don’t feel anything different regardless of dose. Consider that as you up your intake. If you barely notice any changes despite taking doses suited for standard users, it might be necessary to look elsewhere. Kratom leaves have veins that differ in color depending on the strain. Interestingly, these colors can be linked to the effects that can be expected from certain types of kratom. White vein kratom is mainly known as a stimulant, and is commonly sold as kratom powder or kratom capsules. Note, however, that there are further distinctions among white strains grown in different regions. This strain comes from Sumatra, Indonesia. White vein Sumatra is considered more potent than most other white vein varieties in boosting energy and enhancing focus. This one’s quite abundant in the Borneo Islands. 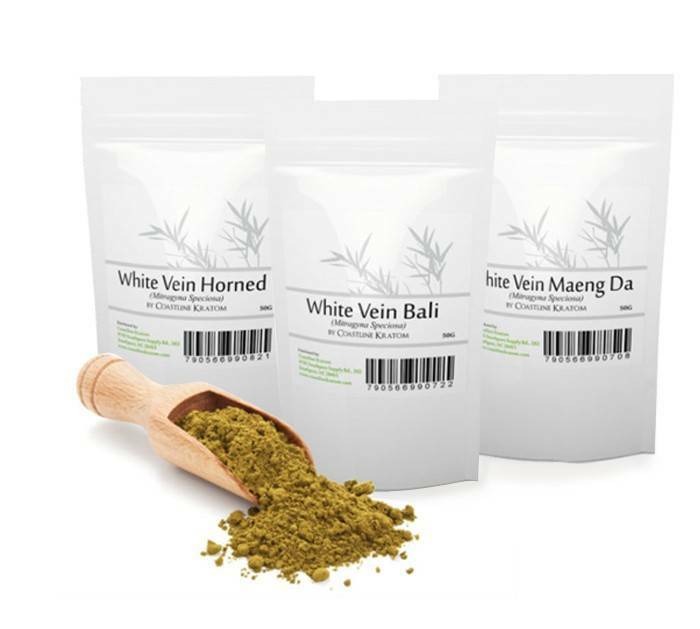 White vein Borneo (aka white Bali kratom) is the choice of enthusiasts who seek a balance between potency and affordability. This variety grows in West Kalimantan, Indonesia. Although this Indo kratom does have stimulant effects like other white veins, it’s mainly preferred by those who require a mood booster or seek euphoria. There are others like white Thai kratom (an alternative to white Sumatra) and white maeng da kratom (another energy booster, though it comes with a mild analgesic effect). People who’ve been taking the herb for quite some time appreciate its coffee-like effect, which is why it’s usually consumed in the morning. It’s even viewed as better than coffee, given that it’s additive-free. Again though, white vein’s effects are somewhat inconsistent. Some only need a small dose to get a noticeable energy boost, while there are those who don’t feel any different despite going for the maximum dose. You can easily purchase kratom products online, but don’t forget to first check your local policies on buying and taking kratom. The USFDA, for example, classifies the herb as an opioid. Also, find out whether the store you’re planning to buy from can really provide a quality product. Check the reviews they’ve garnered, then weigh the pros and cons you find before making a purchase. White vein kratom is interesting—although many enjoy it as a stimulant, there are people who just can’t get any benefit from it. Still, if you’re looking to enhance your focus and productivity, you might as well give it a shot.